Customize Your Car and Dominate the Underground Racing Scene! Boring tracks that have no twists or turns. Put the Pedal to Your Mettle! Nothing sparks life in an adrenaline junkie in the big city better than a high-speed drag race through the streets themselves. In CSR Racing, you’ll have the opportunity to do exactly that from the safety of your smartphone or tablet computer. Take the car of your choice, fine tune both its performance and appearance, and pit it against the most pimped-out rides the city can throw at you. If you can beat the toughest crews, you then might have a shot at entering the big leagues against other players! The racer’s spirit is strong, but the body needs a sturdy and stylish vehicle to match it. CSR Racing provides all sorts of opportunities for you to make the car you always wanted to have. Purchase a variety of real-life cars manufactured by Audi, BMW, Ford, Nissan Chevrolet and more. Improve your car’s performance by purchasing all sorts of cool upgrades. Acquire new engines, tires, bodies, turbos, intakes and more. Make a ride that suits your play style. Customize the appearance of your vehicle. Give it your favorite paint job, make your own custom plates, or add your own decals. Level up to unlock even greater upgrades for your car. CSR Racing is not your typical racing game. It won’t put you directly behind the wheel like most out there, but it will give you a more cinematic view of the action as it challenges you in ways you never thought were imaginable. Watch the race unfold between you and your opponent. Watch your fully customized ride burn rubber across the city in glorious 3D graphics that will push your mobile device to the limit! Give your car an extra boost of speed during the countdown with a few calculated pushes of the gas pedal. This should hopefully give it a nice head start once the race officially begins. Shift your vehicle’s gears with a tap of your finger. Timing is everything, so keep your hand on the switch and don’t even think about letting it go. Pick up a nitro boost to give yourself a quick burst of speed that can be used anytime during the race. Take on the city’s most notorious crews to prove who the ultimate drag racer is. Work your way up the racing ladder to unlock more districts of the city and challenge even tougher racers. Earn money by winning races, getting a perfect start, shifting gears with exact precision, and more. Racing against the computer will certainly be enough to keep most people on the edge of their seats. Meanwhile, those who are capable of beating the crews with minimal effort can instead opt to challenge other racers online. 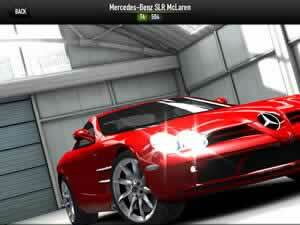 Racing against other players adds a whole new dynamic to CSR Racing. Head on up to the servers and make your vehicle available for other would-be racers to challenge. Alternatively, see which players are ready to eat your dust and throw down the gauntlet on whoever you like. Check out how other players have tuned their cars and let them see just how superior yours is in terms of looks and performance! Earn bonus cash by getting a winning streak against other players. 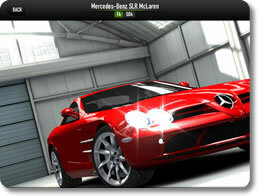 CSR Racing gives us an alternative look at how racing games can be played on a mobile system. It tests your speed and reflexes while providing an intimate look at the race in action. It also offers a nigh-unlimited amount of ways to build your car and the new perspective lets you admire your handiwork as it leaves all the competition in the dust. The singleplayer campaign on its own is long and intense, but the multiplayer means the game can pretty much never end. If you want to experience a new kind of racing game with untold amounts of customization, then you cannot go wrong with CSR Racing! Racing games have been a mainstay in the video game industry since almost the beginning; seeing them on the growing mobile market should not be a surprise to anyone. Furthermore, the new hardware and control capabilities of mobile phones, smartphones and tablet computers has brought with it a wave of experimentation; developers are constantly devising all kinds of new ways for us to race. CSR Racing is among these experimental titles, mixing classic conventions with some seldom-used mechanics to help it stand out from the crowd. To be perfectly honest though, the new mechanics don’t exactly contribute much to the experience. Compared to more traditional racers, this game can come across as a tad simplistic. That is not to say that CSR Racing is a total bust; it does some things exceptionally well and it oozes a lot of style in the process. It just won’t get the adrenaline pumping like it should. Worse is that in spite of its advertised status as a free game, CSR Racing makes no secret that it intends to go straight for your wallet. CSR Racing looks good. It looks really good. The vehicles and environments are depicted with full three-dimensional graphics that take full advantage of the iPhone’s current graphical prowess. There are over a dozen cars included in the download and each one can be customized to look however you like. You’ll see everything you put onto your car, including the paint job, the decals, the stylized rims, and whatever else you decide to throw onto it. People are only represented as two-dimensional portraits, but even those are well drawn to look slick, stylish and individualistic. You can tell that the artists had a lot of fun designing the characters of CSR Racing. The game pulls all the stops to feel like a simulation of the dark and glamorous world of underground drag racing, much like the Midnight Club and Need for Speed: Underground series. It’s not enough that you have to own a car and know how to drive it; you need to look the part and show the competition that you mean business just by your appearance alone. Let it be known that when it comes to vehicular customization, CSR Racing stands head and shoulders above all the other mobile racers. Nearly every aspect of your car can be tuned up and enhanced. You can switch out your engine for one that will give you greater speed and acceleration, change your car’s grip with a variety of different tires, alter your intakes, add turbos and nitrous, and so on. Just about every single component you put into your car will alter its performance in some way and the number of vehicles you can effectively put together is utterly astounding. 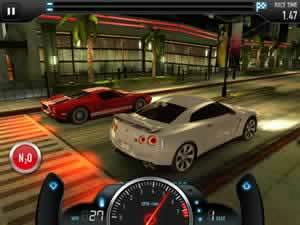 Many commercial games would be envious of CSR Racing’s possibilities. Customization does not only affect things that are under the hood. Appearance also plays a role. You can alter the color and shape of your car’s body, add some sporty stripes to it, and even make your own custom license plate. The most notable aesthetic feature you can put onto your car is a decal pattern. These add some very decorative images to your vehicle that not only look cool, but can also increase the amount of money you win in the races. In short, it’s very easy to make a unique and stylish ride that can stand out in the crowd, and CSR Racing strongly encourages you to do so. When a racing game has customization that is as deep as CSR Racing’s, you know it has to be an awesome racer. Sadly, that is not entirely the case. This is not a traditional racing game; you won’t be behind the wheel controlling the car’s movements while slowing down and speeding up when necessary. Nor will you navigate through twisting streets while moving at over one hundred miles per hour. In CSR Racing, every race will take place against a single opponent on a single stretch of road that goes in a straight line. You will not steer, brake, speed up or slow down when you feel like it. The only control you have at your disposal is your ability to change gears. Racing is pretty simplistic when you get down to it. Player skill and computer AI does not really make the difference between victory and defeat. More often than not, the results of every race will be determined by the overall statistics of the cars involved, not by the actions of the people driving them. That is not to say that player agency is completely absent; you will be required to shift gears every now and then at specific times, and your timing is absolutely vital in making sure your car can inch out the opposition’s. You can also activate your nitrous for a one-time boost in velocity, assuming you have any on hand. However, more often than not, if you lose a race, it’s because your vehicle is just not up to snuff and you’ll have to spend more of your hard-earned in-game cash at the mechanic to fix that. Basically, CSR Racing does not have the most exciting racing out there. Despite its look and presentation, it’s not a driving simulator. It’s more of a game of strategy. You have to determine what combination of parts will be needed to beat the competition. In that regard, it could be considered a bit more cerebral than more traditional racers, but even that’s pretty simple at heart. There is hardly anything strategic about making your car statistically better than the one belonging to the other guy. In this regard, it becomes apparent what the developers of CSR Racing are intending. They want you to constantly upgrade and tune up your ride. Doing so costs money that you get largely by winning races. Expectedly, cars and parts grow increasingly more expensive the better they get. If you want to progress, you have two choices. You either “grind” for money by repeatedly winning easier races to build up your cash reserves, or you spend real money to get the goodies more quickly. The way items are delivered to you only make CSR Racing’s freemium model more apparent. You don’t get your new cars and parts immediately after ordering them; you have to wait for a certain amount of time before they’ll arrive. If you just can’t do that and want to race with your new toy right now, then you have to pay in gold. Gold is a rare currency that can often only be obtained by purchasing it with real money. In short, CSR Racing puts you into a precarious position; you either have to submit to the highway robbery that the game is imposing on you or you have to put off your fun. CSR Racing may be free to download, but trying to seriously enjoy it will require that you pour at least some money into it. It’s ultimately up to you to decide how much it’s really worth. On one hand, the car customization is dynamite. No matter how far you progress, there’s always some new part or vehicle to get. On the other, the racing is very simplistic. Even if you find it enjoyable, which it might very well be in short bursts, you’ll still need to sink a lot of time and real money into the game just to stay competitive. If the idea of putting together a dream car you can’t otherwise afford in the real world sounds intriguing, then by all means give CSR Racing a spin. Just don’t be too surprised if it doesn’t hold your attention for long.